New Year's Day event canceled! 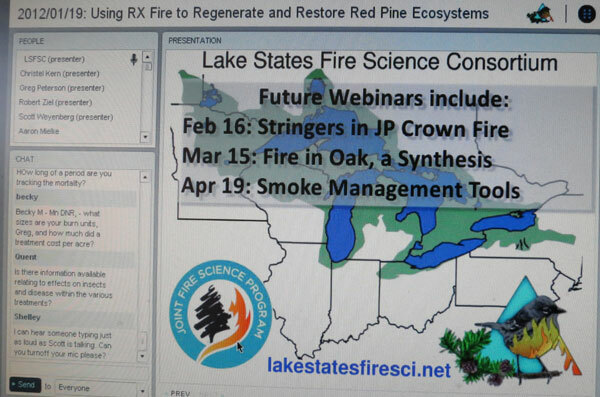 The Lake States Fire Science Consortium is an entity available to anyone in our area doing prescribed burns. Supported by grants, it is adminstered by Ohio State University but the committee includes people from all the "lake states". Here is their mission statement: "...to accelerate the awareness, understanding, and adoption of wildland fire science information by federal, tribal, state, local, and private stakeholders across the Lake States from Minnesota to New York, and the adjacent Canadian provinces of Ontario and Manitoba." Anyone interested in joining and receiving their monthly newsletter and other announcements should access this link. The webinar topic yesterday was Use of Prescribed Fire to Regenerate and Restore Red Pine Ecosystems. The presenters were Minnesota folks in the northern part of that state, where red pine is an important ecosystem. Although this is out of our direct interest here in southern Wisconsin, I still found the webinar interesting because of the general principles presented. A principal goal of prescribed burning in these northern red pine ecosystems was the control of hazel (Corylus americana), a shrub that is a dominant member of the understory there. Hazel can shade out and greatly inhibit red pine reproduction. Since hazel is an important member of the understory in our oak savannas, we often discuss whether we should be controlling it. Although it is not out of hand here, apparently it is a real menace in northern Minnesota. In the red pine ecosystem, prescribed fire is the best way of controlling hazel. Not with spring (dormant season) burns, however, but with mid-summer burns. In fact, dormant season burns not only do not reduce hazel, but actually increase its density. This is because spring burns only top-kill hazel, followed which it resprouts vigorously. In contrast, mid-summer burns actually kill the shrub, although the best results are obtained by burning annually. Even biennial burns are not as effective, and burns at less frequent intervals are virtually useless. Since we rarely do summer burns in southern Wisconsin, I was interested to learn how these burns are done. The strip headfire technique is used exclusively. However, since the burns are being carried out in the heat of the summer, there is a great possibility of killing the red pine itself. Because of this, summer burns must be carried out exclusively as backburns. 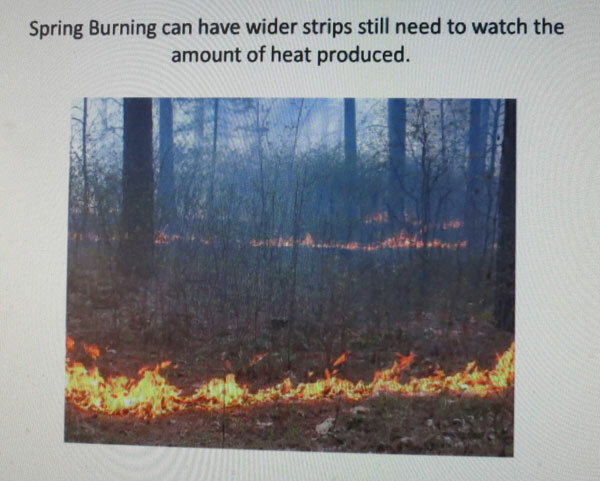 To keep any head fire from developing, the strips are kept very close together, as the photo below shows. Summer burns are thus quite time consuming. Smoke management is more of an issue than it is in the spring and there is lots more mop-up. 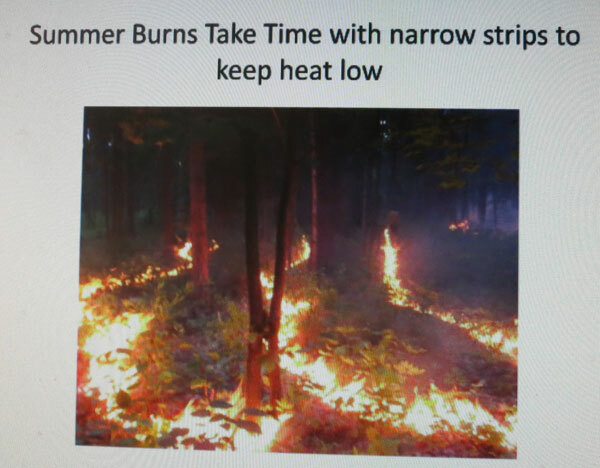 The photo below shows a burn in a similar area carried out in the spring (dormant season). The strips are lots wider, and the whole burn can be carried out lots quicker. All of our savanna and woodland burns are also carried out as strip headfires. I found this webinar quite interesting and useful, even though it was in a different type of ecosystem. The schedule for the next few webinars is shown on the photo at the top of this page.